The financially beleaguered Saguaro Ranch development in the Tortolita Mountains has provided the town of Marana and Pima County with thousands of dollars in development fees--and the potential for thousands more in future property taxes. It's also provided its neighbors with a few lessons in the world of high-end development--and just how much trust they should put in public officials. Just ask Tracy Chamberlain, a Saguaro Ranch neighbor who filed a lawsuit last spring, along with several other neighbors, in an effort to get a judgment in Pima County Superior Court on the legality of Saguaro Ranch CEO Stephen Phinny blocking the public from using a mountain-loop road. The problem is, Phinny is blocking a road--used by nearby residents and recreationists for hiking, biking, driving and horseback riding into Tortolita Mountain Park--that is considered a public easement. 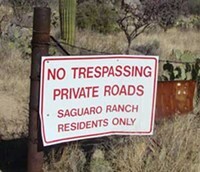 Chamberlain and her neighbors have been fighting over two access points to these roads, because Saguaro Ranch employees have placed boulders across the road entrances for the past few years. Neighbors keep making a point of removing the boulders, even though Phinny usually replaces them several days later. According to Chamberlain and fellow plaintiff Steve Blomquist, Phinny tried to involve Marana town officials and the police, hoping threats of trespassing arrests would scare the neighbors away. 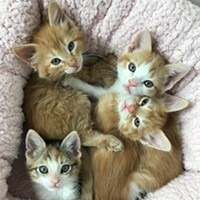 However, town officials refused to get involved, telling Phinny and Chamberlain they were treating this is as a private matter. Last spring, Marana town attorney Frank Cassidy recommended that those same neighbors go to court and ask for a judgment to determine their legal rights to the easements ("Tortolita Showdown," May 22, 2008). 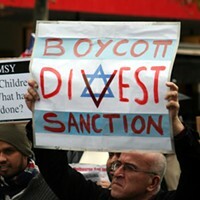 The neighbors took him up on his advice, and their lawsuit will go before Judge John Davis on Monday, Jan. 26. Chamberlain and the other plaintiffs hope the judge takes a close look at the results of a survey the neighbors did of the roads that lead into Saguaro Ranch and go into part of the Tortolita Mountain Park. The survey markings show the dining room of the development's restaurant, McClintock's, lies right on top of the recorded public road. Some now-abandoned construction areas are also on top of the road, which has been maintained as part of an annual agreement Chamberlain and her neighbors have paid for as part of their homeowners' association since the 1970s. The lawsuit will also cover a deposition from Cassidy taken in October. 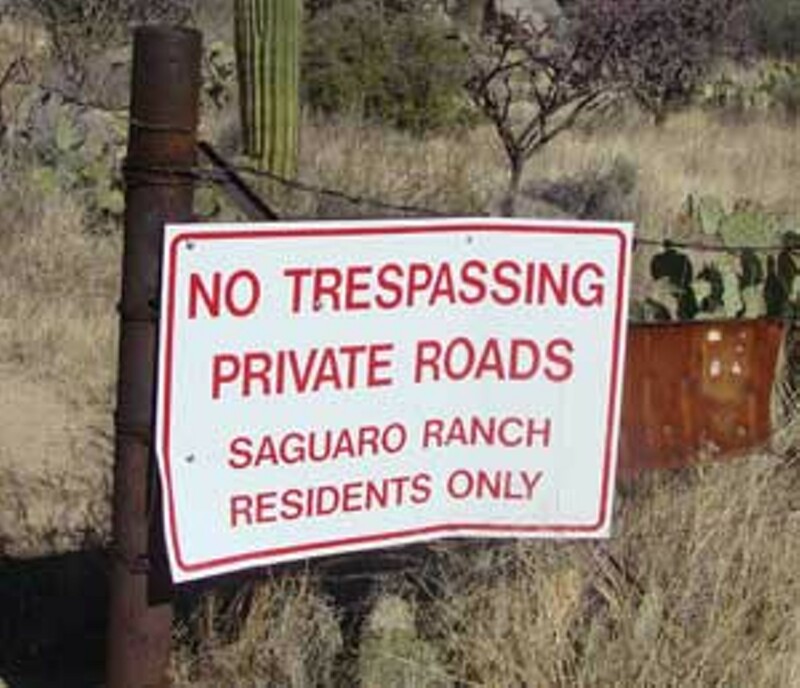 Phinny, through attorney Craig Keller, has declared all along that the road is private and was abandoned by Marana, which annexed the Saguaro Ranch property in 2002. Cassidy's deposition, however, makes it clear that the town never formally abandoned the easement. As of press time, Keller had not returned calls and an e-mail request for comment. Until recently, Chamberlain says, she was hoping the town would stand by what it had previously stated: that Marana officials would stay out of what they considered a private matter. In December, that changed when she heard that town officials were preparing a proposal to bring to the Town Council on Feb. 3 to abandon a public right of way off Thornydale Road--a right of way that leads into the public easement that Chamberlain has been fighting to keep public. Chamberlain says she's worked hard to maintain a good relationship with Marana officials and staff. She met with officials recently to explain that it didn't make sense to abandon the right of way, which she uses to travel to a school-bus stop near the Saguaro Ranch entrance, where she drops off her daughter each weekday morning. And she explained that losing the right of way meant the loss of a legal entrance to the public easement. On Friday, Jan. 16, Chamberlain learned for the first time--from the Tucson Weekly--that the town changed its plans to also include abandoning the public easement that she and her neighbors had been fighting for. Chamberlain described the news as "devastating." "It is hard for me to deny a sense of betrayal and/or manipulation by the town of Marana and Frank Cassidy," Chamberlain says. "... What's the sudden interest in the abandonment?" Chamberlain says she also finds it strange that Marana Mayor Ed Honea submitted a declaration to Saguaro Ranch attorney Keller in December saying that all along, the town has recognized Saguaro Ranch was intended to be a private, gated subdivision with restricted access. Cassidy confirmed the town's interest in abandoning both the right of way near the Saguaro Ranch tunnel and the controversial easement, saying that the town decided to finally get involved, because Chamberlain pointed out that abandoning the right of way rendered the public easement useless. Cassidy also said that when the lawsuit first came before Davis last spring, the judge challenged the town to take a legal stand. Cassidy says the final decision on the abandonment rests with members of the Town Council; in other words, what happens in Davis' courtroom could be moot. Chamberlain says she doesn't want to turn the current lawsuit into an attack on Marana. Chamberlain and Blomquist continue to focus on Phinny--who they say led his legal and planning team to allegedly and purposefully ignore a recorded public easement in order to get his plan approved by the county and Marana. One example they cite is a plan presented to the Pima County Department of Environmental Quality which allowed Phinny to build a septic system smack in the middle of the easement. Typically it's against the law to put a septic system in the middle of a road. When Chamberlain and her neighbors stumbled upon the construction of the septic system last year, they showed officials the property was a public road, and not a nonmotorized path, as was noted on Phinny's submitted plans. PDEQ officials admitted they made a mistake, and as a result, they told Phinny the system wouldn't get final approval until it was tweaked in order accommodate traffic. That supposedly happened--although access to the road has continued to be blocked, most recently by the development's backhoe parked in the middle of the road, just feet from Phinny's home and the septic system.